Tyson wants more states to ease their laws surrounding workers’ comp – often to the impairment of their employees’ health. Tyson, one of the largest meat-packing companies in the U.S. pays for workers comp out of pocket, instead of shipping it off to a third-party insurance provider. Tyson Foods is huge: 115,000 workers in 400 locations around the country including Texas. A powerhouse in the industry and, perhaps, in government too. A new investigation by ProPublica and NPR suggests Tyson is at the forefront of a major push to trim more than just fat from workers’ compensation. ProPublica’s Michael Grabell says while a lot of companies lobby local and national governments, Tyson is taking it to a whole new level. Tyson is the second-largest meat-packer in the world and the largest chicken and beef producer in the U.S. But meat packing plants are dangerous places, Grabell says. That means the company pays claims out of its own pocket. 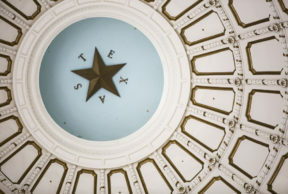 “Tyson does something that’s unique to Texas in that they have dropped out of the workers’ comp system and created their own injury benefit plan that they completely control outside of state oversight,” Grabell says. Tyson has a lot more at stake then a normal company might, Grabell says. While nothing in Grabell’s research suggests Tyson does anything outright illegal – companies can go very far in donating their money and having their voice heard – he says the company often has a direct line to government officials’ ears.